Well, i installed the flowvis on the check valve coming back from the solar heater line.. like i mentioned before, the flap doesnt really move much and still didnt with the flow vis.. so much so, that i dont really see a good reading on the gauge.. maybe 5 gpm.. i'm not positive the red indicator even moves from being off to on.. I'm not sure whats going on or maybe this is normal and expected. That is with all the water sent to the solar? That does not seem possible. By all the water sent, which do you mean. Its when the actuator valve is in the middle position, so solar goes left, return is to the right, a 50/50 split.. when the valve is set to solar off and to the left, again, the psi really doesnt change either.. i'm really puzzled.. was the 8 foot plus a little more to go all the way up to the roof too much for the 1.5 hp pump (doesnt seem possible) and the pressure coming back down is minimal? Or is my valve position wrong in some way.. there has to be a way i can prove things are working or not.. aside from the fact i show the solar water heating up, but if its trickling into the check valve, this probably means its not heating the pool up much despite being 5-7F warmer? IE: today.. started at 63F, pool heated to 67F on a day where the high maxed at 70 with moderate sunshine throughout the day (and the solar water temp was reading 72 or so, roughly 5F higher at one point around 3pm). I'm not so sure that the pool would have heated up 4F on a 67F day without the solar, that said, its still puzzling. Sounds like you need to send more water to the solar. At a 50 50 split I would think very little water would go to the roof since it is easier to go to the pool. Yeah perhaps thats all it is.. so basically i'd want to try it so the closed part is not aiming in between but more a little to the upper right at the 1pm position then instead i think right? Doesnt the hayward actuator have a manual mode so i dont have to adjust the cam at first, to just test it.. i seem to recall something about the handle moving 4x or similar.. this way i can slowly move it to be sure i dont cause an issue, like the time the valve auto went the whole way to the right and everything started gurgling and pulsing (on the return lines etc). Not sure. Some actuators are easier to move manually than others. Check the manual. You can also just move the handle manually until you get the flow you want, then set the cams to follow. To move the valve manually, be sure the controller is set to off, loosen the thumbscrew on the valve handle a few turns and push it down. While you hold the thumbscrew down you should be able to freely move the handle. If it doesn't move, back off a couple of more turns so it pushes down further. This is explained in the actuator instructions. Once you reset the cams, test the actuator movement with the pump off. This way if it does something unexpected you can't dead-head the pump (if it's not running). I had seen this in the instructions but couldnt quite understand or get it to work.. i guess i can try your tip as well.. though i already messed with it manually tonight by removing the whole actuator.. I'm not sure how the flow vis is supposed to look if the right flow is going into it.. ie: filled with water to the top or like it is for the most part, real low in the check valve.. slight pulsing of the water.. showing maybe a 2.5 by looking at the lower red plastic piece as the indicator.. I move the handle further to the right, so as to start blocking the flow to the swg/return area and nearly all water going through the panels.. wait about 1 minute.. no change in the indicator.. still at the 2.5.. still low in the glass, certainly never gets "full" to the top or the valve doesnt open. Then as i made the "mistake" early on.. if i move the handle so it completely closes the path to the SWG, the swg hoses start pulsing and gasping (for air? ), the pool is gurgling.. the check valve shows water come up a bit briefly, then suddenly it vacates all the way down.. as the pool continues to make horrid sounds.. so based on that i hurry and pull the plug (this all within 10-20 seconds of moving the handle full closed to the right). I dont know what to make of any of this.. for now i set the cams to allow it to be slightly more to the right than center, but not close enough to close off that side or cause the gurgling. In any case the psi stays the same.. 19.. throughout, on or off (strange). I"m at a loss.. i'm wondering if another test maybe i dare have the pump on, solar on.. and start to unscrew the drain plug on the garage wall for the return and see if water shoots out, as if it just trickles out or slowly leaks out, then there surely cant be enough return pressure coming back.. if it shoots out then maybe the valve is fine? Or some other safe test to prove or disprove parts of this equation? EDIT: perhaps it really needs to go so its closed to the right, despite the gurgling and pulsing.. maybe i should just let it even out, maybe it takes more than 30sec to 1min? It just "felt" unsafe..
Something doesn't seem right. I can run my system with 100% solar without any of the issues you describe. The only difference between us is I don't have a SWG (yet). By 100% you mean all flow goes to the panels and back to the return basically.. like i try to do by closing off that right port? here is my layout again.. the side with "Should be off?" is the side i'm trying to "close off" towards the return side when all craziness breaks out: (maybe the right side needs to be directly connected at the location of the tee on the right, maybe air is getting trapped in that section that remains "open")? (old pic before the flowvis) Or is the crazy pulsing "dead-heading?" Agreed. something is definitely not right with your setup. I still think maybe my right side should be more like something like this? No area of trapped water that can go nowhere. If so I prob need a new valve since I have a bend on the right. In this companies layout there is really no "dead" section of pipe like i seem to maybe have when my valve is in the full on position. Your plumbing looks effectively the same as that picture. Do you have pictures of the panels installed on the roof? When you turn on the solar do you get a lot of air blowing into the pool? Maybe thats the gurgling i'm hearing.. is that what you mean by air? When i set it to that full right 100% mode you mean? How can i tell if its air per say. Picture wise, just what i have on the first page of this thread (first post).. input is the lower left in the images and upper right has the vacuum breaker and return line coming back. You dont feel that extra piping that is "unused" when full 100% could be causing this issue? (air?) Originally i figured it would just fill up with water and (reverse back) head on to the SWG in that space. Is there something else i should look for as well? How long did you run with all the flow to the solar? Maybe close off the bypass about 90% so that there is no chance of air getting trapped. The very first time you run the system, you should be in 100% solar to fill the panels and purge the system of air. You will know when the system is pretty much clear of air when the bubbles of air stop coming out the returns. 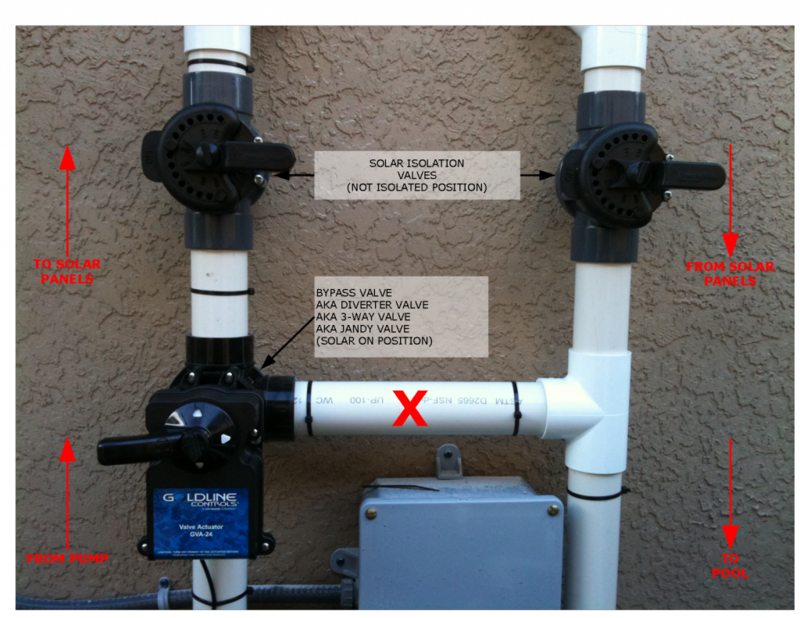 When I fill my solar array I can hear the bubbles of air moving through the PVC pipe. Once the system is purged of air you can add a bit of bypass to the system if you need to reduce pressure/flow in the solar array. If you are always running at a 50/50 split on the valve, I doubt the panels are getting much if any flow, as the water is going to take the path of least resistance which would be to stay at ground level and return to the pool. this would also explain why you don't get a PSI change at your filter when you switch between solar and bypass....... because at a 50/50 split you may always be bypassed. There is no point in trying to run 100% solar the first time since as soon as the solar or pump is turned off, the panels should drain. Doing what you suggest would require 3 valve positions if normally partially bypassed and no solar controller will do that. Thanks guys for all the help to this point.. i think i'm finally full on solar.. so all previous test results on temperature increases are moot and starting over from here. Today the water sits 62F (down from its high of 72 the other day).. one night the outside temp hit 50F and lost 5F without a solar cover.. so despite me saying that i didnt think the solar cover helps much, i think those nights where it drops 5F, saving 2-3F is worth it.. on nights where it would lose 2F without one, i might have saved 1F, so it depends on the low i guess whether its worth the effort at least to me.. So ill update over the next few days, once we get more sun here.. cloudy today i think. I wasnt sure what you meant here, though i posted my results just after this.. i'm no expert, but, i dont think the panels drain when they go from full 100% on to off.. i do see the checkvalve pressure goes to nill though.. i would think if they did, each time i went back to 100% i'd get the crazy air issue.. i tried a few toggles, its smooth, no issues.. seemless other than it goes from no pressure on the check valve to 30 gpm. So the question is now.. do i worry about 21psi vs 19 off.. leave it be.. or do i swap out that return nozzle which is hayward 0.75 for the 1" to try to bring the pressure down slightly. I'm also wondering what my input pressure is (for the sake of wondering).. i think the 21"+1.5 hp is rated at 2650 gph max (44gpm roughly) (bigger tank gets it closer to the theoretical 3750 or so).. maybe some day ill chuck another $90 at another flow vis just to see if i'm around 44gpm just after the filter. I noticed i can probably lower the GPM on the solar return by making the valve stop just slightly short of full 100%, but i dont think there is a need to.